All year long I try to remember ideas for Christmas gifts for the various family members, decorating ideas, recipes, activities etc. This year I decided to get ahead of the game and make myself a little mini Christmas note book that I can keep all of my ideas and lists in one place. It's small enough to fit in my purse so when I'm out and about I can jot things down right away and not have to rely on my spotty memory! The only thing that I would do differently is try to find a smaller pen to use....the RSVP pen is a little bit big for my purse but you can't beat that it matches! I used some old and some new on this project. The DSP is from the Sweet Pea paper pack (retired) but doesn't it look awesome with the Cherry Cobbler binding and ornament? I think I might have a color combination for Christmas cards on my hands here. The ornament stamp is from Delightful Decorations which I am thrilled made it into the big catalog from last year's mini catalog. I bought so much from that mini that I was praying some of it would make it into the big catalog so I could keep demonstrating (and not blow the stamping bank account) this set as I love it and didn't get to use it as much as I would have liked to last year. I punched out the ornament with the ornament punch. I stamped the little star burst/flower (what do you think it is???) in Old Olive and then punched it out. I adhered everything together and refrained from using a dimensional....I know right, no dimensionals??? I figured being raised up would just catch the ornament on things floating around in my purse and I didn't want it getting ripped off the mini notebook. Last but not least I added a little BLING to to the ornament. Reminder to my local stamp club ladies--TUESDAY is Stamp-A-Stack at 7pm!! 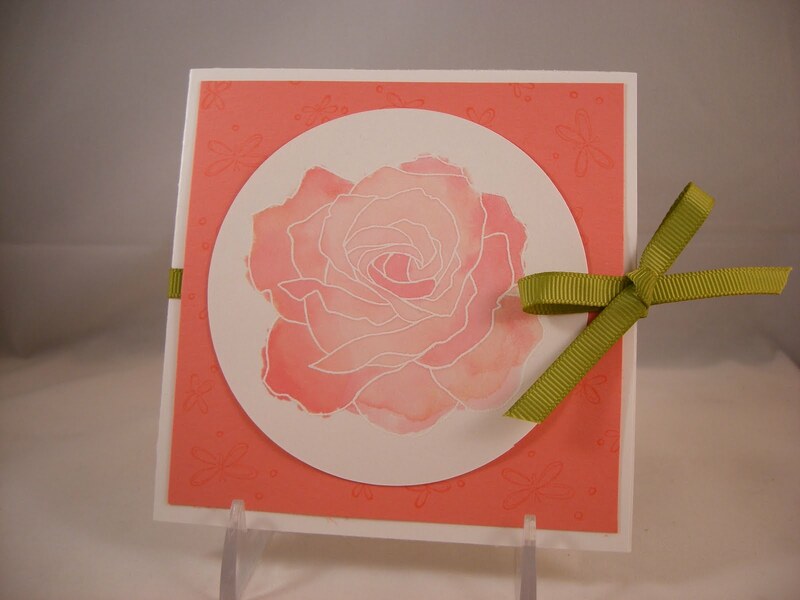 Have you been working on your Stampin' Challenges? I have the prize all set and can't wait to see what everyone has made! I was in Target last week and I saw a card that had cherries on it and I thought it would be good inspiration for a card. I also needed to make several thank you cards for the organizers and hosts of our neighborhood picnic which was held last Saturday. So here's the card I came up with. It's pretty basic but I like how the colors pop. I also fell off the wagon and used an embossing folder....I just can't help myself! All that white was just screaming for some texture! I don't know if you can tell from the photo (are they any better?? I'm starting to figure out the new camera) but I covered the cherries with Crystal Effects so they are raised and shiny. If you don't have Crystal Effects you should get a bottle. I use it all the time and I've had the same bottle for FOREVER so it really goes a long way for a little investment. Another fun thing is that I trimmed a very very small piece of Wild Wasabi cardstock and used it as "thread" for my button. Off to Sam's Club & the playground! Thanks for looking! Happy Stamping! I promised the other day that I would show a card that didn't use an embossing folder....it was hard but I did it! I might have to look into getting some help for this problem. One full card with out an embossing folder in sight! 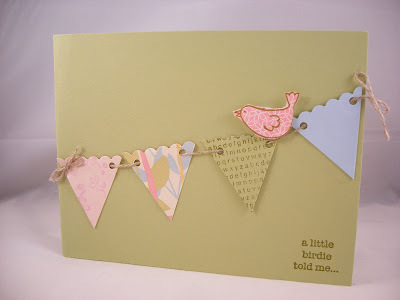 I was browsing through cards online and came across this card by another demonstrator, Sam Woodruff and I totally loved how she used the birdcages to make the background paper. I just had to CASE (Copy And Share w/ Everyone) the idea for one of my cards. I think Sam's card is way better than mine but I tried to do her idea justice! I had decided that I wanted to use Tangerine Tango for this card and went to my trusty new Color Coach to get some ideas for other colors. It suggests Tempting Turquoise & Old Olive. I threw in Daffodil Delight on my own accord so if you don't think it goes with the other colors don't blame the Color Coach. After I had stamped the background (which was super easy with the clear mount stamps) I played around for a little bit with what colors to use for the panels behind the cages as well for as my scallop circle. I had all 4 colors cut and punched out and kept changing them in and out and nothing seemed to be just right. Then I thought "what about black as an accent?". I tried it out and the black panel, ribbon and sentiment seem to balance out the other bright colors in just the right way. I stamped the 4 little birds and then punched them out with the 1 3/4" circle punch. I mounted it on a Tangerine Tango 2 3/8" scallop circle punch which I paper pierced each scallop and highlighted the holes with a Signo gel pen. I used my markers to color the sentiment from So Many Sayings (retired---I think I need to get some new sentiment stamps!). I punched it out with my word window punch and adhered it to the circle with a little small strip of dimensionals. Then I adhered my scallop circle onto the birdcage panel also with dimensionals. I added the bow with a glue dot for the final touch. Just a quick card I did for a 5th birthday party this weekend. The theme of the party was ice cream sundaes so I thought the cone would be close enough! This one came together pretty fast once I decided what to do. First, I ran the Whisper White panel through the Big Shot using the Perfect Polka Dots embossing folder. Someday soon I promise to show a card without using an embossing folder! And then I used the ticket corner punch so this layer wouldn't be too boring. To make the cone I first cut a triangle out by hand using So Saffron cardstock. I ran this piece through the Big Shot using the Square Lattice embossing folder. Then I sponged the edges and a little bit in the middle with More Mustard ink. The ice cream scoops were punched out with the scallop circle punch and the lower third of the circles were snipped off. The Chocolate Chip scooped was stamped with the sprinkles from Sweet Scoops using Chocolate Chip ink. The Pink Pirouette scoop was sponged along the edge with Pink Pirouette ink. I topped the cone with a 'cherry'. After not doing much with buttons in the past I'm beginning to really like them-- Now to just get the other 3 color collections! Of course I needed to have a happy birthday somewhere so I stamped the sentiment from Fundamental Phrases in Chocolate Chip and punched it out with the large scallop punch and layered it on a Pink Pirouette scallop oval. A band of striped Pretty in Pink grosgrain ribbon (retired) behind the cone & sentiment finish this sweet card for a sweet birthday girl. Here's a quick card I made a few weeks ago using Circle Circus and some fun summer colors. I was trying to come up with a design for a Christmas card for an upcoming Stamp-a-Stack (visit my Stampin' Up! website over on the right sidebar to view my upcoming events if you're in the Richmond, VA area and would like to join us) and obviously this went in a totally different direction but I still thought it was fun enough to show. The Wild Wasabi panel is embossed with the Vintage Wallpaper embossing folder and mounted onto a Whisper White base. I stamped all of the circles with various colors and various stamps from the set. I didn't start with an idea of how I wanted this panel to look I just started stamping until it was filled to my liking. I didn't worry about overlapping circles or getting the whole image onto the panel. Next, I stamped several of the circles and then punched them out. I mounted them on a corresponding circle on the larger panel with dimensionals. For a larger focal image I stamped the large scallop circle with Pumpkin Pie and then punched it out. I added a smaller punched out circle to the top and finished it off with a Basic Rhinestone in the center. This scalloped circle is also popped up on dimensionals. A small grosgrain ribbon knot on the other side balances out the rest of the panel. This is a great card to make and have on hand and add the appropriate sentiment to later when you need it. It can be a birthday, a thank you, a thinking of you, even a get well card...who wouldn't be cheered up looking at all this brightness?? This is basically the same layout as my Happy New House card from the other day. Using the Top Note die and some small scaled DSP (Welcome Neighbor DSP & Sweet Pea DSP both retired) gives a nice backdrop to this cute little truck. The truck was stamped on watercolor paper in Stazon and then water-colored with an aquapainter and reinkers. The tires were colored with the aquapainter and a black Watercolor Wonder crayon. 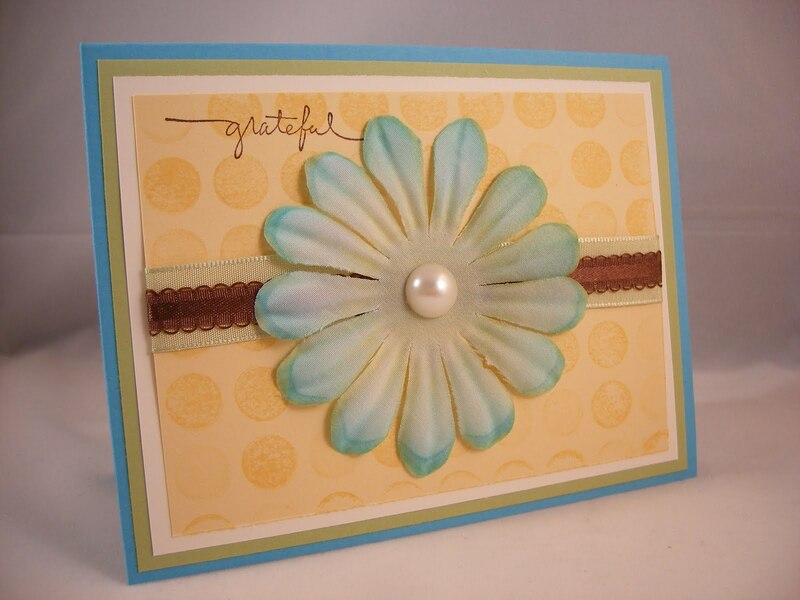 I stamped the sentiment with Stazon and then punched it out with the new 2 3/8" scallop circle punch. I sponged some Rich Razzleberry along the edges so it wouldn't look so stark against all that color. It is also popped up on dimensionals of course. The Pumpkin Pie rick rack ribbon across the Top Note is some that retired last year (?) and it was all the ribbon I had in that color. I guess I know something that will be added to my next order! And can you guess what I used on the Rich Razzleberry panel??? Yes, another card that I used an embossing folder on! I think I'm addicted, is there a hotline or something?! For this one I used the Square Lattice embossing folder. The final pieces of the Pick Up Truck puzzle are the 3 buttons from the Brights collection. It just so happens that all 3 colors used on this card are from the Brights collection so I had a button of each color. I threaded some linen thread through the holes and held the ends down by glue dots on the back which also held the button to the card. Hopefully it wasn't too lumpy for the USPS! I used 2 different challenges for this card. The first one was the color challenge at Just Add Ink last week. Rose Red, Always Artichoke, Very Vanilla & Crumb Cake. The second challenge was a sketch challenge at Create with Connie & Mary. I didn't follow the sketch exactly but it was certainly a driving influence. I also CASED my friend Jenn's Fifth Avenue Floral swap card for the ribbon treatment; you can see that post here. So what did I do here... the base is Crumb Cake. I put the length of Rose Red grosgrain ribbon around the Crumb Cake base and secured it with some SNAIL and then a layer of Rose Red which was run through the Big Shot using the Elegant Lines embossing folder. I used the ticket corner punch on the edge of that layer. Then I cut a circle out of Always Artichoke using the Circle Scissors Plus and trimmed the edges that overhung the Rose Red panel. I stamped it several times with the leaf stamp from Just Believe in Always Artichoke. I didn't reink my stamp each time so there are variations in the depth of color. For the Thank You panel I inked up the stamp with my Always Artichoke and Rose Red marker and stamped it on to Very Vanilla. The sentiment was stamped with Crumb Cake and again it was easy to line up with the clear mount stamps & blocks. I used the ticket corner punch on this layer as well as the Always Artichoke layer. And of course I popped this all up on dimensionals. The final 2 touches are the paper piercing along the edge of the circle and the strip of pearls (LOVE these!). Hopefully this photo is better as it was taken with the new camera. I think I still need to just take my photos in the daytime but it's hard to get into the stamp room to do much when the little boys are awake so I usually wait until the evening to stamp and photograph but even with the light box the colors seem a little off. I'll keep experimenting and someday I'll get it right! Most of the cards that I've been stamping lately are still thank yous for all of our events in July. This one is going to my brother-in-law and his family for the birthday gifts they gave the boys. Something else that I still love is the Sweet Pea DSP pack (retired) that was in the spring mini. I love it so much that it's still kind of hard to cut into for a project but I'm trying to be good and use it so my stamp room doesn't end up on an episode of Hoarders some day. So I used a piece of it to layer behind my ice cream cone. The ice cream scoop was stamped in Pretty in Pink and then masked so I could stamp the cone just right. The cone is stamped in So Saffron. I then stamped the cherry on top in Rose Red. I punched it out using the smaller scallop circle punch and layered it on the new larger scallop circle punch. To give the cherry some 'pop' I covered it with a small dab of Crystal Effects and then sprinkled a bit of Dazzling Diamonds. Definitely let this piece dry before handling it too much or sticking it into an envelope to mail. Some scraps of 5/8" Chocolate Chip grosgrain ribbon (retired) are tied into a knot around the DSP piece. Another cherry & the Thanks sentiment are stamped on the bottom. The Thanks was inked up using the Chocolate Chip marker so I could omit the "Kind" and just keep the "Thanks". First off I want to apologize for the poor quality of this picture. Over the last several weeks our camera has been slowly dying and this is one of the last photos I took with it before it went kaput. This card had to be mailed out so I can't take a better picture with the new camera that arrived today. Hopefully future photos will be improved (at least once I learn how to use our new darling!). I borrowed the color combination from the Idea Book & Catalog and was going for a fresh fun summer look. I think Wild Wasabi is fast becoming one of my new favorites. When it was first introduced as an In Color several years ago I was just a customer and still focusing on acquiring all the colors from the 4 color families so I didn't pay much attention to Wild Wasabi or any of the other In Colors. Now I am certainly paying attention to it! The Wild Wasabi base was run through the Big Shot with the Perfect Polka Dots embossing folder. I layered 4 Whisper White scalloped squares on top and then added my fruit. For the fruit I stamped them on the colored cardstock with Versamark and then embossed using clear embossing powder. I cut out the fruit and adhered them to the squares. I finally got around to using one of my new buttons from the Brights collection. I tied a bow through the button with some white embroidery floss (non-SU) and layered it on top of a strip of Melon Mambo faux rickrack made with the scallop edge punch. I've found that a glue dot on the back holds it on pretty well. Today's card is a quick one I made for a friend and her family when they recently moved into a new house. I just love how all of these designer papers work together. They are all from the Welcome Neighbor 6x6 pack that was free during Sale-A-Bration this year. The stamp set Good Neighbors was also free during Sale-A-Bration. I used the Big Shot and the Top Note die along with the DSP for the layer behind the house. It's really easy to just adhere the paper to the cardstock and then run it all through the Big Shot. I tied a piece of the new Old Olive 3/8" taffeta ribbon around it and made a knot. The stamping is straight forward; The house was stamped in More Mustard and Rose Red. It's really easy to line these stamps up using the clear blocks, you can see right where you want to stamp. The tree is stamped in Old Olive and I used my Rose Red marker to color in some of the "leaves" to look like apples. The clouds are stamped with Baja Breeze. I used a quick sticky note mask to get one of the clouds behind the other. I punched the whole scene out with the new large Scallop Circle punch and then sponged the edges with Baja Breeze ink. The whole Top Note shape is of course popped up on dimensionals. Basic Gray is a nice color to use on masculine cards and I paired it with Very Vanilla. The large top layer of Very Vanilla was run through the Big Shot with the new Vintage Wallpaper embossing folder (yes I have used this a lot lately! Hope you're not too sick if it yet!). I wrapped a bit of Basic Gray taffeta ribbon (retired- Booooo!!) around the embossed panel and then topped it with the Thank You sentiment from Thank You Kindly. I used the ticket corner punch to jazz up that panel. There you go.... ***Edited to add: I totally forgot to say that I got the inspiration for this card at Pals Paper Arts. They are having a Masculine KISS (Keep It Simple, Sweetie) Challenge this week. This card fits the bill I think! I made this card a week or 2 ago using a sketch challenge over at Pals Paper Arts. You might remember my Aviary Owl Thank You card which used the same sketch. Isn't it cool how different it looks when you change the colors and stamp set? Anyway, I had the large Rich Razzleberry flower left over from a previous project so I wanted to try to use it up. It was already cut out and I can't seem to throw anything away. I looked in my Idea Book & Catalog to see how they used the Vintage Vogue set and I got the rest of my colors from one of the samples. I used the new Vintage Wallpaper Textured Impressions embossing folder for the large Rich Razzleberry background panel. I added a narrow strip (read- scrap) of textured Rose Red. Then a larger strip of River Rock that I tore the edges and stamped the vine on it with River Rock ink. I added a thank you sentiment in Rich Razzleberry that was stamped off once- I didn't want it to be too bold on top of the River Rock. I stamped more vines in River Rock on a Very Vanilla panel and then added my Rich Razzleberry flower. I gave it 2 friends; one in Bashful Blue & one in Rose Red. The Rose Red flower is popped on one dimensional and the Bashful Blue one is popped up on 2 (just stack them on top of each other to get more height). Two cute little Old Olive leaves and the floral portion is finished. Now for the embellishments! The ribbon is Old Olive taffeta wrapped around the floral panel and adhered with a brad. The End! Here are the swaps from my July Stamp Club that I promised to show. After some finagling I got the photos from the camera to the new Mac (it took me longer to figure out how to rename them than anything!). So here they are! Enjoy these beautiful cards from my very talented stamp club. Andrea's card. How cute are these little banner flags? Jenn's Card. She did a great job watercoloring! Karen's Card. I love these colors and how she colored the tips of the flower. Kristen's Card. I really like how she has the large butterflies popped up. 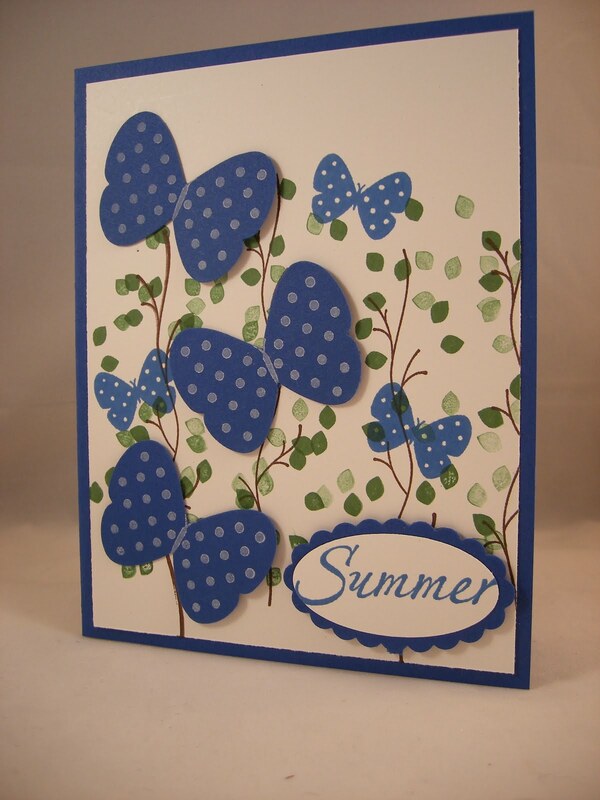 Great summer card! Here is the card I made for my stamp club swaps. I got the inspiration from an altered notebook layout in a recent issue of the demonstrator only magazine Stampin' Success (another great perk to becoming a demo---have any other questions just ask, I can talk about stamping all day!). It was fun playing with some of the new colors and new stamp set Just Believe. I really like this layout and want to try it out with some other colors and stamps. It's amazing how different the same layout can look just by changing out a few elements. For this one the base is Crumb Cake with the leaves also in Crumb Cake ink (I'm soooo glad we have ink to match this cardstock now!). I used the scallop border punch on the top edge of the Very Vanilla layer. I stamped the sentiment in Early Espresso and then paper pierced across using the template to make sure it was straight. I also pierced each scallop on the top to bring it all together. The 3 circle panels were stamped in Certainly Celery, Marina Mist, and Cherry Cobbler and punched out with the 11/4" circle punch. I layered these on 13/8" circles punched out of Early Espresso. My stamp club member who participated in the swap gave me permission to share their awesome swap cards as well so I'll be back to post those tomorrow once I get them off the camera. It might take some doing since we got a new computer (thanks to my fall down the stairs last week!) and I haven't learned to download the photos from the camera yet....wish me luck!